Final del partit al Camp Nou! Despite being on a run of one win in five in all competitions, Barca led inside two minutes with Coutinho bending home a sensational first-time strike to complete a wonderful team move involving Messi and Suarez. Guilherme Arana struck the post but Messi scored a typically brilliant second for his side in the 12th minute, running on to a superb Suarez pass and cutting inside off the right flank to find the bottom-left corner from 20 yards to record his 25th goal against Sevilla. 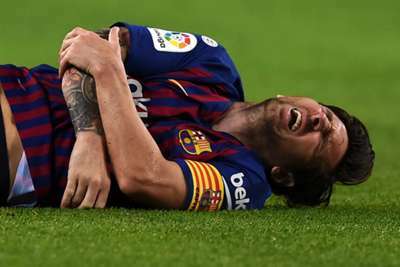 Messi, though, was then replaced by Ousmane Dembele after landing heavily on his right arm, Barca's treatment team initially patching him up but finding he could not continue. Marc-Andre ter Stegen then produced a remarkable double stop before Suarez extended Barca's lead when he sent Tomas Vaclik the wrong way from the penalty spot after he was felled by the goalkeeper. Rakitic added a late fourth with a controlled volley against his old club but Sevilla still had the final say, Muriel bending home a fine finish in added time. Despite a welcome win, Barcelona will be concerned about Messi's injury ahead of next weekend's Clasico. Getting back to winning ways will be a huge relief for Valverde, but Messi's injury gives him another headache. Barca are arguably more reliant on their talisman than ever before and if he is out for any serious length of time, their title aspirations will be severely dented. A wonderful double save from Ter Stegen was a vital moment for Barca, who then quickly extended their lead from the penalty spot after Suarez was felled. The first save from Andre Silva's header was brilliant but blocking the rebound from Franco Vazquez was arguably even better. Incredibly, Ter Stegen made another amazing double save in the closing stages to keep out Muriel and Sarabia. Behind Messi and level with team-mate Sarabia, Wissam Ben Yedder was among LaLiga's top scorers this term with nine in all competitions, but the striker had little involvement. Sevilla - now winless in 16 games at Camp Nou - were on the back foot from the off, however, blunting his impact. - Messi and Cristiano Ronaldo have scored 25 goals vs Sevilla in LaLiga each one, a shared player record against an opponent in the competition. - Messi has been involved in at least a goal in 18 out of last 19 meetings versus Sevilla in all competitions (19 goals and 12 assists). - Coutinho scored the second fastest goal in La Liga this season (01:58), only after the goal scored by Ezequiel Garay for Valencia against Barca. - Sevilla had completed 19 shots (including blocks) against Barcelona, the most for a team against Ernesto Valverde's side in all competitions this season. European action for both sides this week with Barca hosting Inter in the Champions League on Wednesday and Sevilla welcoming Akhisarspor in the Europa League a day later. On Sunday it's Huesca at home for Sevilla, while Barca will hope Messi is fit to face Madrid in the Clasico.